Anyway, dear readers, internet connection permitting, here I am once again. Better late than never. So, we have a bit of catching up to do! Sunday was a day spent selling cheese to the good people of Parson’s Green, including of course, Mad Parrot Woman. She brought me a magic potion this week for my aching cold fingers and toes .. something vaguely peppery in a strange brown bottle. Works like magic apparently ... I will keep you informed! Greatest comedy moment in the market was watching James of Little Jack Horner’s Pies giving his full attention to a small person in pink that could only just see over his table. It was a quiet spell in the market and he was giving her the full sales pitch ... ‘Pies’, said the small pink voice. ‘But these are no ordinary pies, madam. These are potted pies in enamel tins. And I buy the tin back off you or give you money back on your next pie’. 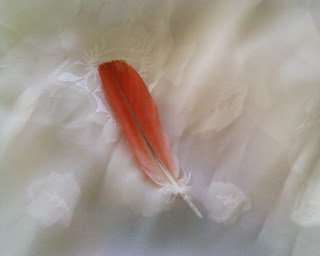 ‘Pies’ said the small pink voice again before it bounded off to find a larger human without an apron and scary beard. Nice try, James .. 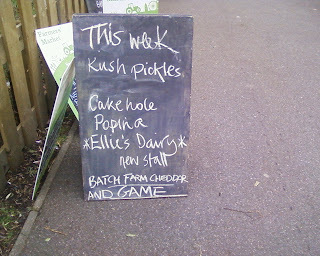 It must be something about going to Parson’s Green that encourages the goats to be naughty when I am away. Remember the occasion when they broke the gates and got out into the barn? Yes, well ... I arrived back on Sunday and was talking to David in the barn when he suddenly said to me – ‘I think we may have a problem’. A problem?? We don’t have problems .. only challenges and opportunities ... I followed his eyes and saw what he had already spotted – a couple of little goatie faces staring out at us from INSIDE the milking parlour. Ah .. yes .. you could be right. We may have a problem. In fact, it wasn’t a problem – it was a riot. Or had been. Judging by the amount of poo and chaos that greeted us when we opened the door, it would seem that every single goat had been in the parlour that afternoon. David had been out there early afternoon and so it couldn’t have taken them very long to turn the place upside down. 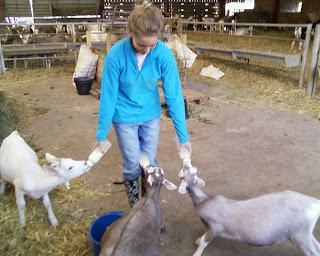 There were about 20 goats stuck in the actual milking parlour – they were able to get in, but could not get out without a human to lift the parlour away for them. They were just standing there patiently, if a little bored. The feed bins were totally empty, the lovely large basket of apples from Franklins Farm Shop (waiting to be chopped and shared) had been totally trashed, though not the basket itself fortunately, as I have to return that to Franklins this week. And so before we could even think about milking on Sunday evening we had to do a massive cleanup and thorough disinfect of the parlour as well - just what I wanted on a freezing cold Sunday evening after a weekend of London markets! And how had all this happened? 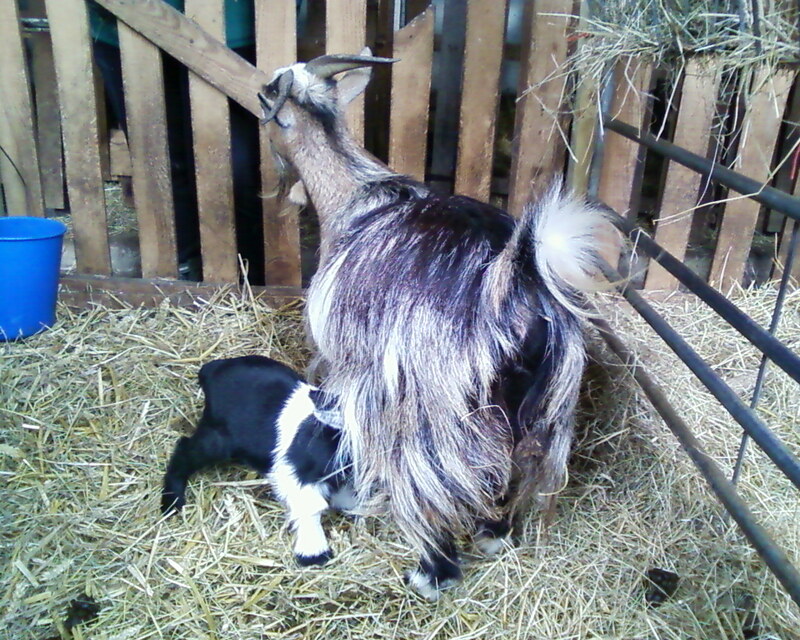 David has a theory that one of the goats managed to open the gate into the parlour. 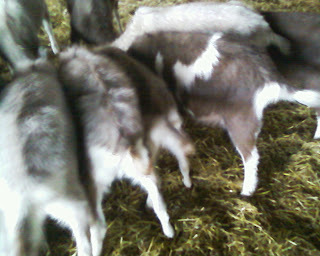 It is possible as they are very very adept at opening gates, even ones that are meant to be goat-proof. We have one goat in particular, who is very good with gates - yes, Willow, you know who you are - but she usually opens them and then steps back to let others through so that she doesn’t get the blame. I just wish that we had a CCTV installed to capture the fun! Monday morning began with a little gentle exercise. Little Hermione had been in the wars last week when one of her ear tags had started to rub for some reason and I had been bathing and spraying it for a few days – she was sporting a lovely blue ear for most of the week. However, yesterday morning, she decided that enough was enough and that she wasn’t going to be caught again. Round and round the barn we went ... 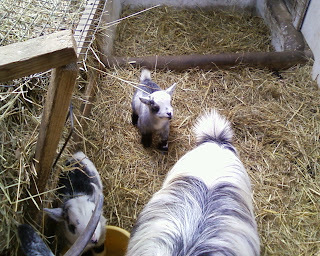 Trying to catch a small speedy and very determined goat in a large barn is virtually impossible when you are on your own .. Eventually I had to call in reinforcements – fortunately David was working just up the road and so came along to help catch her. Round and round we both went .. We managed to get her eventually and having looked at her ear again we decided that we should cut the ear tag out and let the ear heal up properly as it was starting to look quite nasty. So, now she has a blue ear with a hole in it! But not to worry, it will heal up and when it is quite better, we will put a new tag in for her. Needless to say - she won't come anywhere near me again at the moment! She just gives me a dirty look and walks off in the opposite direction. or rather ... Debbie goes to Wimbledon Market. Lovely market but not a womble in sight. So, first time out at Wimbledon - good established market that has been going for about 10 years. And we made it onto the blackboard by the entrance! 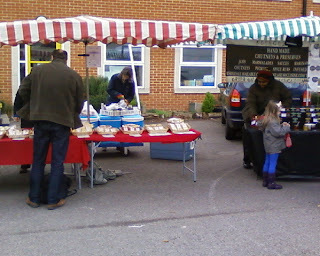 Sadly I was next to the very delicious Cakehole stall ... rude not to come home with several pieces of cake. David was happy that they had baked cheesecake so I think I may be allowed to go again next month. All our cheese went down very well, especially the Shaggy's Beard camembert which was absolutely spot on for the market. Nice and ripe, just starting to run. Delicious! Sold out of that one. 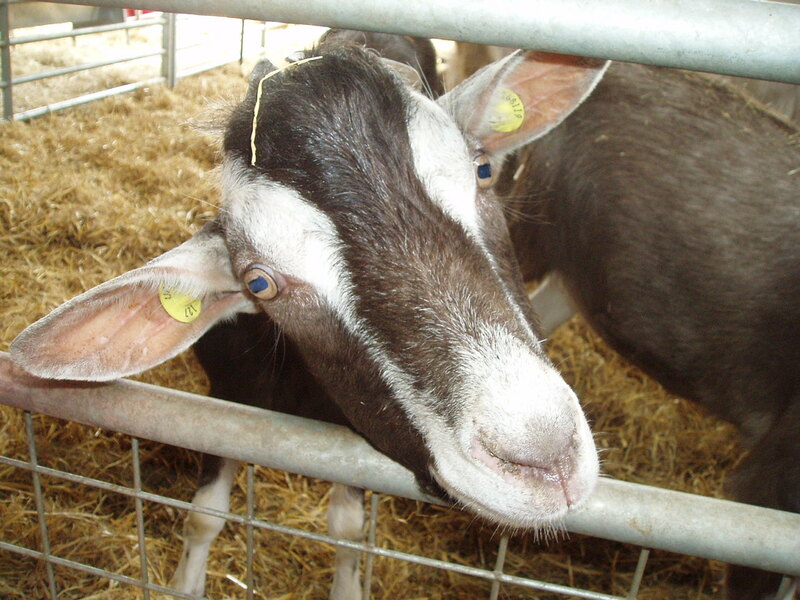 Also sold out of milk which was great - people are starting to learn about us in the London markets and come looking to find the stall as we are the only people doing raw goat's milk on any of the markets. I had also taken some diced kid meat along and that also proved very popular. I have managed to find my special Sri Lankan goat curry recipe which I will copy and take along to Parson's Green tomorrow - it's a delicious flavoursome curry (not too hot). Right then .. off to do the hot water bottles (yes, Marmite has one of her own to stop her hogging mine all night) and then to bed ... getting up at 4am does nothing for my wrinkles! So, there I was last night - all fired up and ready to blog about Norville's visit to the vet (as I know that you dear readers were concerned to know how my boy got on). And what do I get? Nothing. Nada. Zero. No internet. Well, not strictly true .. I got some kind of internet connection but nothing that I could do anything with. I tried the mobile broadband (known more locally as mobile narrowband) and my neighbour's wireless connection .. both a pile of the proverbial brown stuff. Anyhow - whatever it was seems to have fixed itself tonight and here I am. So, young Norville was a very brave lad yesterday. Our appointment was not until 11.30am and so I had to separate him off from the other big males to stop him eating breakfast - he had to be starved from the previous evening, much to his disgust. I made a pen for him in front of the little chaps so that he had some male company until it was time to load him up and drive him the few miles to the vet. Here's a good shot of his head so you can see what we were dealing with - see how those horns are pressing into his head? Much better! Hopefully he will be happier now and won't spend so much time rubbing his head against the barn! Whilst I was feeding the youngsters today I was thinking that they won't be the babies for much longer! It seems only a short time ago that we were watching them as tiny babies .. and here they are, all grown up. Well, most of them anyway ... I got a couple of pics of little Diggle goat. Bit blurry I'm afraid but you can get the idea .. Diggle is the very small brown one in the centre of the pics next to Mara (splodgy one). She is actually one of the oldest but has never really grown very much. It doesn't seem to bother her at all though - she just thinks that she is the same size as everyone else! So, off to bed for me .. it's been a long day today. Went down to Sussex to my wholesaler and, true to form, it absolutely poured with rain. It just wouldn't be the same if the sun was shining! Well, the day started with a bit of spaceship spotting as it was a pretty clear morning and the International Space Station was due to come over. So, at 6.45am we stood outside the barns and watched as it moved across the sky - it was visible for about 4 minutes and was pretty high up so easy to spot. I would love to get a decent pair of binoculars to see if you can make out the shape of it at all. He obviously thought that he looked good anyway! I used to hate towing things after a bad experience with a caravan in a high wind on the M3 many years ago! But, it's a case of having to do it so frequently now that I have just got used to it .. I must say that I am getting a dab hand at reversing now as well. Well, almost ... the goat trailer has a very short drawbar and tends to swing very quickly. It does take me a few wiggles round the back of the butchers to get into the right position - much to the amusement of the vet and meat inspector who usually come out to watch. At least they find me entertaining I suppose. First batch of kefir was judged to be ready this evening. I did try it yesterday but it still tasted like slightly warm milk (yuck!) and so I left it another day. I have to say that it tastes a lot better this evening. Next batch is fermenting already! David was busy sorting out the Gracie Moos today. We are getting ready to put a bull in with the older girls and so need to have the calves out of the way to avoid 'accidents'. They are virtually weaned now anyway (doesn't time fly?!) and so he has moved the calves, and last year's heifer, up to the farm. 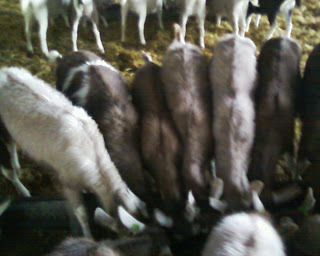 They are now in the area outside the goat barn which my big male goats use during the summer. Of course, they have been separated from their mums and so there was a LOT of mooing going on this evening. The goats were wondering what all the noise was! David had been back to check on the cows in their field a few miles away and said that they were quite noisy as well. They will only be separate for a couple of months and then everyone will be back together again. Sadly, it was too dark for photos when I got home this evening so I will try and get some pics of them tomorrow. There's a bit of competition for this coveted title as you will know from reading previous blogs. However, at the moment, the reigning champion is Moyra who is just a slim finger's width fatter than Footsie goat. Only fitting really as she is due to kid about 5 days earlier than Footsie. 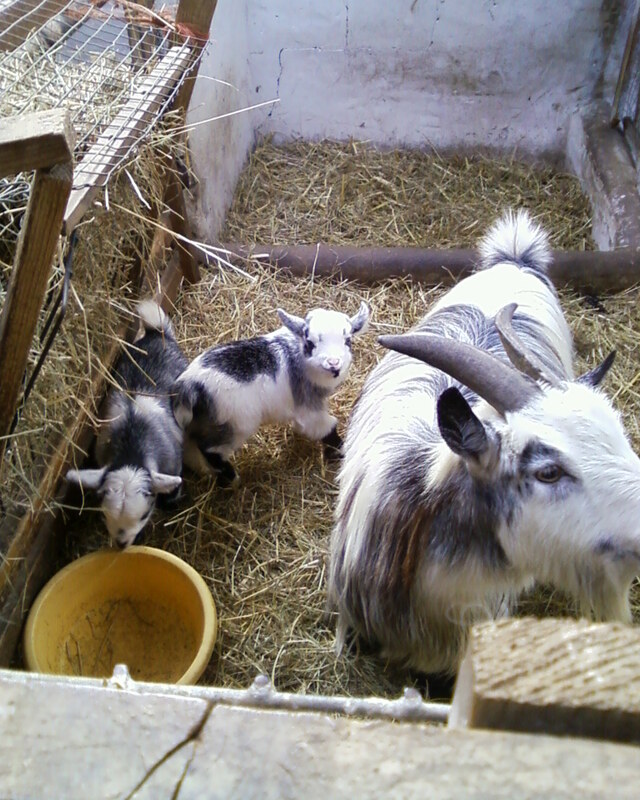 Ginger (the great escaping goat) and Flora are running pretty close though, as are Florence and Betty. Apologies for not blogging on Friday night but I was in the pub :-) Not often we get out for drinky poos these days, but as there is a very nice pub at the end of our milk delivery round on a Friday night, we thought we would pop in for a swift orange juice. Met up with some friends that we haven't seen for quite a while and caught up on everyone's news. Good to see that we aren't the only ones with escaping animals though - our friend Judy had gone outside to feed her 4 ponies on Friday morning to find them gone. Following the trail of broken fences and large hoofprints, they were discovered a few fields away munching on some very nice long grass. Seems that they weren't keen to come back home and, strangely enough, didn't want to eat all their dinner when they arrived! 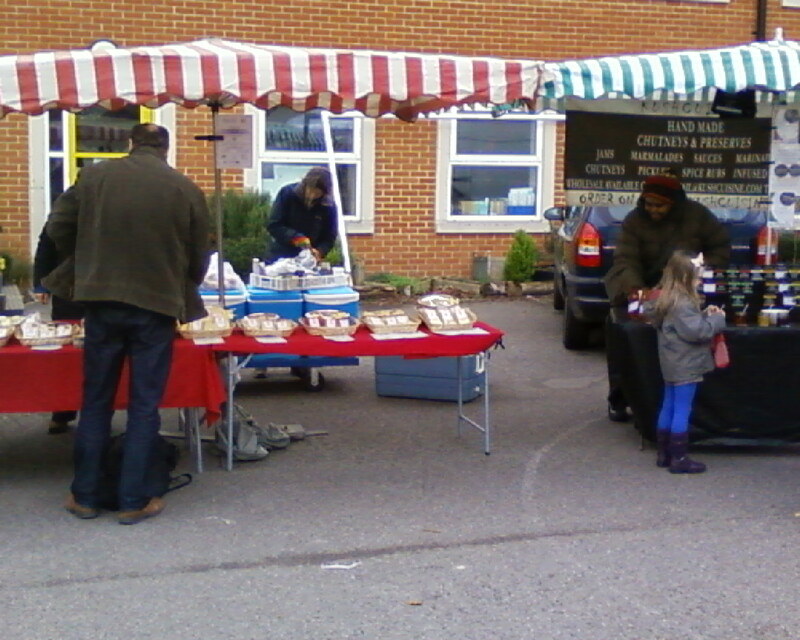 Wye Market on Saturday was steady again. The threatened gale force winds did not appear which was good news for Nicci Gurr, a guest chef, who was cooking up market ingredients during the morning. We sampled some delicious winter greens and leeks tossed in a mustard sauce - absolutely gorgeous. She was demonstrating a few dishes and handing out recipe cards as well. 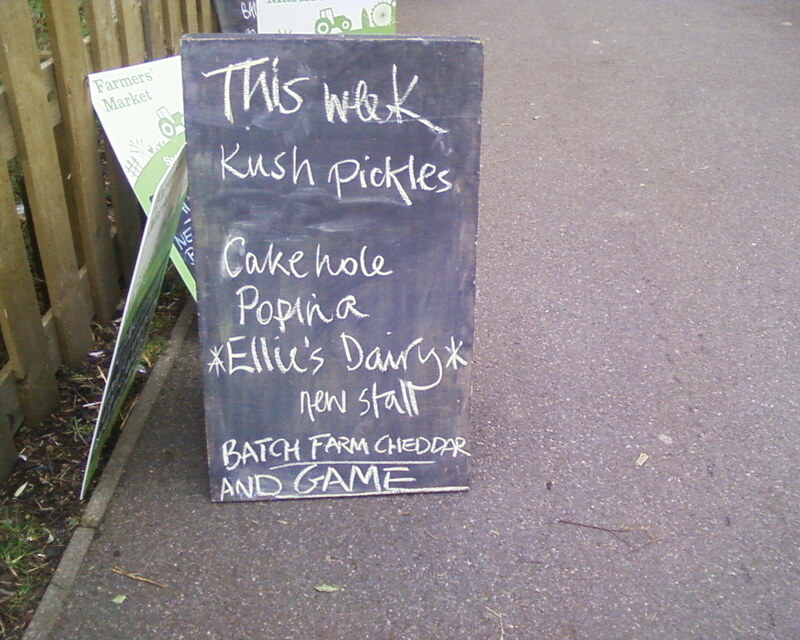 Great way to publicise market produce! I think she will be doing it at a few other farmers' markets over the next month. I was very excited that one of my regular milk customers, Lucy, brought some kefir grains with her for me to try. 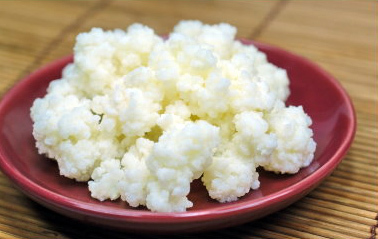 Many of my customers use our milk to make their own kefir and everyone says that it is absolutely delicious. For those of you not familiar with it, kefir is a fermented milk drink - bit like a thin yoghurt. Fantastic health benefits and great for people who are lactose intolerant or have serious stomach problems. Rather then me waffle on about it - check out http://www.yourkefirsource.com/ if you are interested to know more. So, I have my first batch fermenting at the moment - should be about ready this evening or tomorrow morning. And to continue the excitement of the weekend - this morning David and I went down to collect some hay from near Bethersden. Although we do still have a fair bit in the barn, it won't be enough to last the season and so we are gathering more from people while they still have it (and whenever we have enough spare money to buy some!). Bonus of this collection is that Hilary is one of the top pygmy goat breeders in the country and so I got the chance to nosey in her goat shed while David was loading up the trailer with Chris. So, busy week ahead this week - four little chaps to the butcher early tomorrow morning. Then off to make cheese later in the day. And, I haven't told Norville yet, but he's going to the vet on Wednesday morning. Although the boys are disbudded at a few days old, their horns sometimes tend to grow back a little bit (they are known as 'scurs' as they are not proper horns). Usually, they will knock them off but Norville seems to have a bit of a problem with his and they are starting to curve back onto his head. I have noticed that he keeps rubbing his head against large immoveable objects (like the steel joists for the barn) in what appears to be an effort to get rid of them. We have nipped them off a couple of times but as he gets bigger, this gets increasingly more difficult and so I have decided to take him into the vet to have it done properly. It's quite a brutal and messy procedure but as it's done under general anaesthetic, Norville will be blissfully unaware of it. Poor lad. Won't tell him til Wednesday morning so that he doesn't worry about it ..
Every year we seem to become more popular with vet students looking for a work experience placement. Last year we had two second year vet students and a fully qualified veterinary nurse who was looking to go back and upgrade her studies to become a veterinary surgeon. All of them were great and worked really hard, especially with those babies who needed a little extra attention. This year we have already got one vet student, one prospective vet student and a college work experience student lined up. Looking like another busy year! And what of the spaceships?! Well, as we are up and about early in the morning and late at night, David and I enjoy a bit of star-gazing. It's a bonus of living in the country that you can enjoy proper darkness and inky black skies full of twinkling stars. We have recently started to look out for the International Space Station passing overhead and it's become a bit of a hobby now! 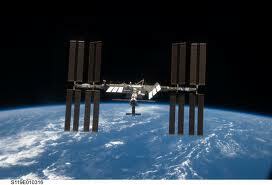 NASA has a great website with loads of information and you can check when the ISS can be sighted from your location. OK, so it's a bit geeky, but it's great when you actually do manage to spot it! This week is particularly good for us, early in the morning. Isn't it just typical though that the weather has changed and it's gone cloudy! Can't see a thing at the moment!! That little pink patch that you can see on his side is where he kept squeezing out through his 'cat flap'! The hair is starting to grow back now though so soon he will be back to his former glory. 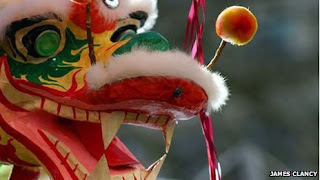 Delivery day as usual tomorrow and then Wye Market on Saturday. Let's hope it's a busy one! It was lovely to see the goats outside in the field again today. I can't believe that this weather will last much longer! Tammy, our oldest girl, was one of the first ones out today. She is the shaggy brown one in the centre of this photo. Flora is the one standing up on her hind legs to the right of Footsie. She is 8 years old this year and I am very surprised that she is still being so active. She is usually a pretty lazy goat (see earlier blogs) but when she is heavily pregnant, she gets even worse. 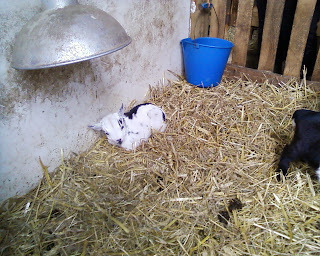 During the final month of her pregnancy, she can usually be found directly under a hay rack so she can reach the hay without having to get up, but she also refuses to get up for food or anything else. David and I have to physically haul her to her feet (no mean task!) and make her waddle over to get a drink or something to eat to make sure that she keeps moving. She just gets so enormous that I think she really can't be bothered with the whole thing and would quite happily just vegetate under a hayrack! And if you have been wondering what Marmite is up to these days .. Lying on the floor next to my washing airer. This spot on my bedroom floor is where the radiator pipes run underneath, so it's always nice and toasty. Fremlin and Larking posing at the gate. The boys (and girls) lift their top lips like this when they can smell something they like - when the boys do it, it's usually because they can smell a nice girlie! All went down a treat after milking this evening. Certainly looks like Perdi goat enjoyed it anyway!! Another glorious day for Balham market yesterday. Freezing cold but beautiful and sunny. Fortunately I have now sorted out my 'cold feet' problem so the only bit of me that suffered yesterday were the fingers but there's not a lot you can do about that when you're serving food. On the advice of Clare the Egg from Wye Market, I bought myself a pair of Muck Boots. Posh neoprene boots. They are just amazing! I hope that whoever invented them is VERY very rich. I have not experienced warm feet in winter for many years and it is just so wonderful. I'm sure that we all wish GeeGee a speedy recovery! I had taken along a few walnuts from the tree at the farm for Sara to take home with her, so hopefully she will enjoy eating those whilst convalescing!! Whilst I was watching the youngsters feeding this morning I thought I would take a few photos to show the many different colours. 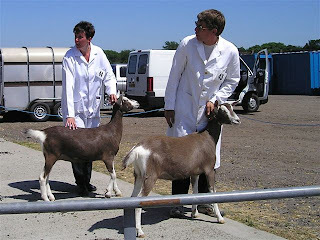 Basically, we have black, white and brown goats. They come in various shades and most of them have perfect pedigree markings - like Betty and Wilma in this picture. 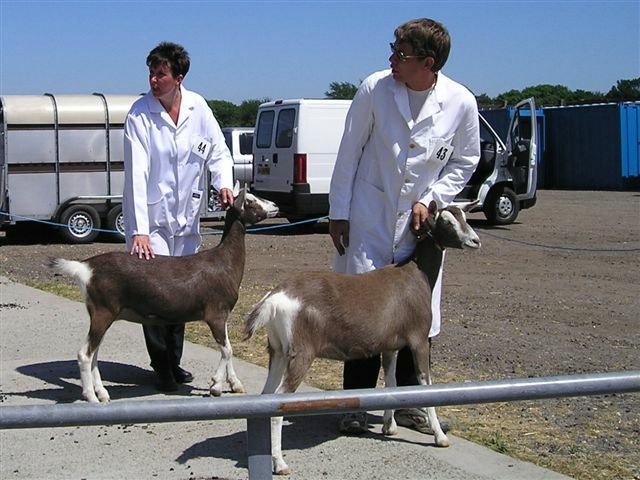 This was taken at a show in 2005 when they were both young goatlings! 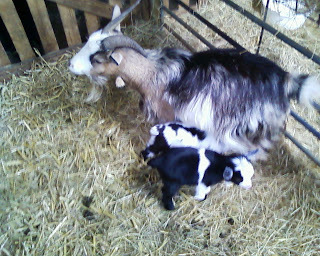 But sometimes, for no apparent reason, you get what the breeders call 'mis-marked' goats. These can range from a slight white mark in the wrong place to the most beautiful spotty or splodgy markings. These animals would not be any good for showing but we absolutely love them in our herd. The more colours the better! Here are some of our little splodgy jobs - all of whom have perfectly marked parents. 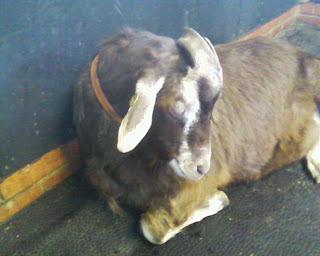 Our very first splodgy goat was Diddi who was born in 2007. She has had several kids since and all of them are perfectly marked brown and white girls. Here are a few of last year's kids. This is Mamkina. She has a black mum and white dad. Her twin sister is completely white. This is Dottie. She is one of Betty's daughters. Her sister is the light brown one to her right.